Gilbert Hernandez is one of the most prolific, forward-thinking cartoonists working in modern comics, showing an immense range and exploring a multitude of genres and storytelling styles in his creator-owned projects. In this week’s digital comic Sensation Comics #14, he applies his keen artistic eye to corporate superheroes for a Silver Age-inspired Wonder Woman story, a retro tale featuring the heavily-muscled heroine as she comes into contact with alien opponents that want to take her prisoner. Hernandez’s story saw print in last month’s Sensation Comics #3, but it finally arrives for digital readers this Friday, and The A.V. Club has an exclusive preview of the first pages. The great thing about Sensation Comics and DC’s other anthologies for its flagship characters (Superman and Batman) is that it gives creators like Hernandez the opportunity to reimagine these classic heroes however they see fit, freeing them from continuity restraints to explore the full potential of these heroes. 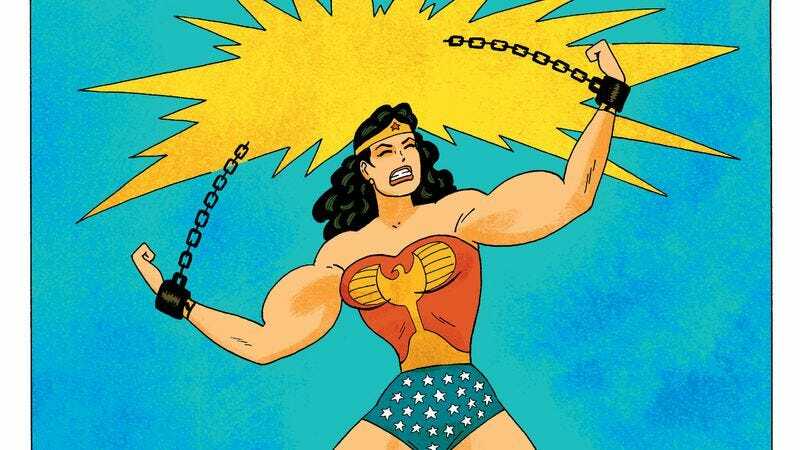 For more thoughts on Hernandez’s Wonder Woman, check out last month’s Big Issues on the character, which explores how Hernandez’s interpretation fits in with Wonder Woman’s legacy and the ideas laid down by her creator William Moulton Marston. Should A TV Room Really Have More Than One TV?